Mukurthi National Park (MNP) is a 78.46 km² protected area located in the south-eastern corner of the Nilgiris Plateau west of Ootacamund hill station in the northwest corner of Tamil Nadu state in the Western Ghats mountain range of South India. The park was created to protect its Keystone species, the Nilgiri Tahr. The park is a part of Nilgiri Biosphere Reserve, India's first International Biosphere Reserve. The Western Ghats, Nilgiri Sub-Cluster (6,000+ km²), including all of Mukurthi National Park, is under consideration by the UNESCO World Heritage Committee for selection as a World Heritage Site. The park is characterized by Montane grasslands and shrublands interspersed with sholas in a high altitude area of high rainfall, subfreezing temperatures and high winds. It is home to an array of endangered wildlife, including Royal Bengal Tiger and Asian Elephant, but its main mammal attraction is the Nilgiri Tahr. 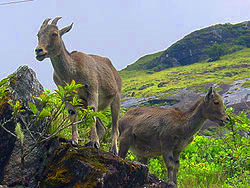 The park was previously known as Nilgiri Tahr National Park.